Wow! We’re in the middle of a winter wonderland here this morning. It’s beautiful but I hope it melts fast. I’m ready for spring. Today’s Free Crudoodle Digital Stamp is Fanny. 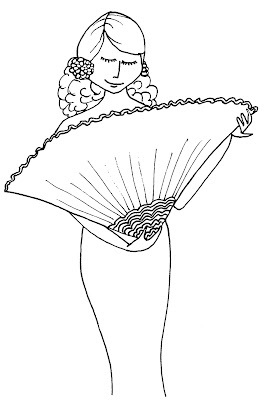 A lovely lady holding a very large, lacey fan. To save Fanny to your computer, please click on the image above, then, right click on the picture, and save to your computer. Posted in 29 faces, freebie, Tori Beveridge and tagged card making, coloring page, crafts, Crudoodle, Crudoodles, Cruzines, digi stamp, digital stamps, doodle, free, line art, paper crafts, Tori B.